CarGurus has 14,933 nationwide Impreza listings starting at $1,499. Although the 4-banger has ample grunt on paper, in reality it feels sluggish, due in no small part to a CVT that lacks the sophistication of most other units currently on the market. Subaru would appear to have a winning formula with its affordable, versatile and efficient all-wheel-drive 2014 Impreza, but a dearth of technology and refinement only serves to shine a light on its competitors’ strengths. If you’re on the hunt for a ride that stands out from the pack, the recently redesigned 2014 Impreza isn’t your best bet, though it may age gracefully compared to more adventurously designed models like the Hyundai Elantra and Nissan Juke. When it comes to selecting the Impreza that suits your taste and needs, you’ll have your choice of sedan or 5-door hatchback body styles and five trim levels, all of which feature standard all-wheel drive. (Although based on the Impreza, the high-performance WRX and WRX STI are considered distinct models, so they’re not covered in this review.) The most basic and affordable variant is the 2.0i sedan, priced from about $18,000 and equipped with 15-inch steel wheels, Bluetooth connectivity, heated front seats, USB and auxiliary input jacks, and the usual array of niceties like power windows and air conditioning. To that, the $19,795 Impreza 2.0i Premium adds 16-inch alloys, upgraded audio, cruise control, chrome accents and a rear stabilizer bar. Those who have $22,195 to spend can live a bit higher on the hog, so to speak, by opting for the 2.0i Limited and its HD radio, 4.3-inch center display screen, leather upholstery, automatic climate control, fog lights and newly standard rear-view camera. In addition to those offerings are two trims exclusive to the Impreza 5-door: the $20,795 2.0i Sport Premium and the $23,195 2.0i Sport Limited. They essentially mimic their non-sport counterparts, with the exception of 17-inch alloy wheels, special interior fabric and distinct rocker panels. My week-long test drive took place behind the wheel of a 2014 Subaru Impreza 5-door 2.0i Sport Limited equipped with a $1,000 power sunroof. The car’s other significant option, a navigation system, was not included. With a $795 destination charge factored in, the MSRP came to $24,990. 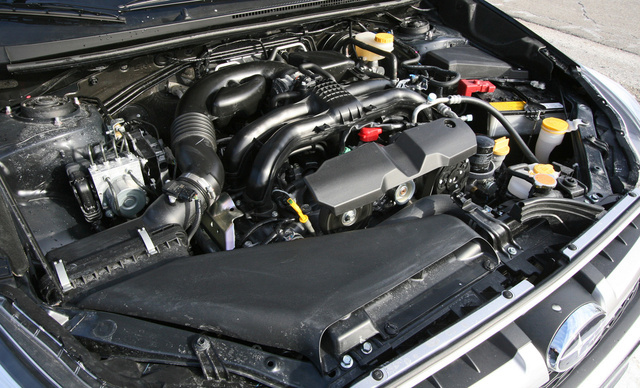 Regardless of which 2014 Subaru Impreza iteration you may be considering, what’s under the hood will be the same. All versions are fitted with a 2.0-liter, 4-cylinder Boxer engine that puts out 148 hp and 145 lb-ft of torque. A 5-speed manual gearbox with hill-start assist is standard on most trim levels, though Limited models—like my test car—feature a continuously variable transmission (CVT) with paddle shifters. According to EPA estimates, the CVT should help drivers average 27 mpg in the city, 36 mpg on the highway, and 30 mpg combined. I averaged 29.7 mpg while traveling on secondary roads and Interstate 95. Unfortunately, that decent fuel economy was the highlight of my driving experience. Although the 4-banger has ample grunt on paper, in reality it feels sluggish, due in no small part to a CVT that lacks the sophistication of most other units currently on the market. Rival automakers—Nissan comes to mind—have done a commendable job of making these transmissions mimic the distinct shifts of an automatic, but the Impreza is more about making high-revving noise than moving forward. The paddles help in this regard, yet even when you’re dictating your own shift points, acceleration is best described as leisurely. Handling wasn’t any better, with electric steering that was vague on center and failed to give me much sense of what was going on between the tires and the road. As for the ride, the most obvious offender was the suspension, which kept little to itself and made sure I felt the countless bumps and bruises on New England’s roads. 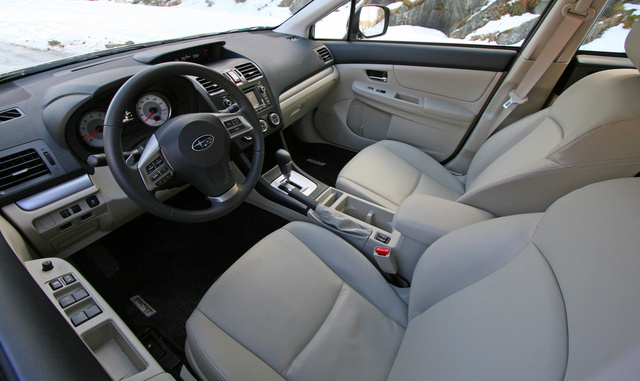 While it may not have been enjoyable to drive, my 2014 Impreza 5-door tester was plenty comfortable thanks to a height-adjustable seat that delivered decent support, a tilt and telescoping steering wheel, and a sliding center armrest. That last item was a welcome addition, until I realized that, when moved forward, it effectively blocked access to the buttons used to activate the heated seats. Relocating those to the instrument panel, or perhaps closer to the shift lever, would make things a lot more convenient. As for the rear split-folding bench, it was bolstered by a comfy recline angle and ample overall room, but the center position—as you might expect—was hampered by stiff cushions and a significant floor hump necessitated by the AWD drivetrain. Consider this Subaru to be a 4-passenger ride with space for 5 in a pinch. When the occasion calls for hauling stuff instead of people, the Impreza hatchback’s wide cargo opening and relatively low liftover make loading easy and, by pulling a couple of tabs on the seatbacks, you can increase the usable space to 52.4 cubic feet. 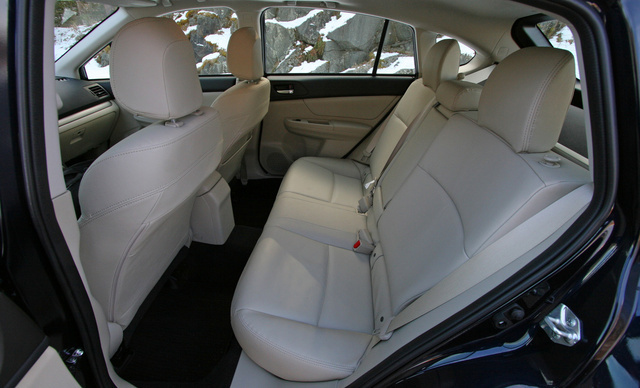 Elsewhere in the cabin, storage provisions include large front and small rear door pockets, several cupholders, a deep cubby below the instrument panel and a couple of slots on the center console. Covering all of those bits and pieces are somewhat disappointing materials. The Impreza does feature a padded dash and upper door sills, yet most of the interior is draped in hard plastic, and the Limited’s leather, while seemingly durable, feels like thick vinyl. To be blunt, tech-crazy car buyers won’t be wowed by the Subaru Impreza. 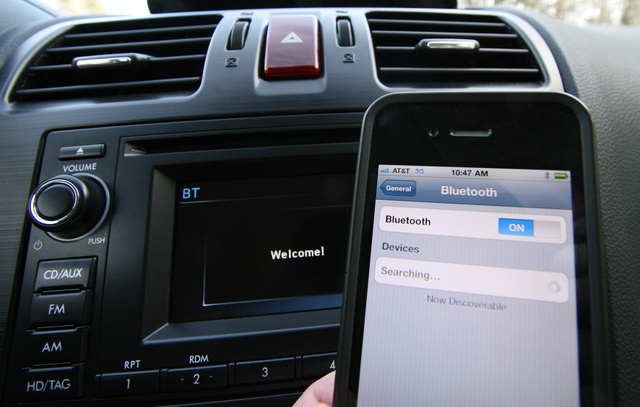 With that said, one of the few changes for 2014 was the addition of Aha smartphone integration within the optional navigation system, which is offered in Premium and Limited trims. That’s also your ticket to satellite radio—no nav means no XM or, for that matter, iTunes tagging, text-messaging assistance or touchscreen controls. Adding the system to my test car would’ve increased the sticker price by $2,100. So, in essence, Subaru charges more than two grand for access to my favorite stations, such as Classic Vinyl and Raw Dog Comedy, something that comes standard in a $14,000 Chevy Sonic LT.
Bluetooth, on the other hand, is fitted to even the base Impreza 2.0i, though the setup isn’t foolproof (the fool, in this case, being me). In most test cars, pairing my iPhone requires hitting a few buttons, waiting a matter of seconds and getting on my way. With the Impreza, I started the process by tapping the phone icon on the steering wheel, selecting a language when prompted, viewing a Welcome intro screen and then waiting as the system searched for my phone. Apparently, this was not destined to be a match; after multiple failed attempts, I gave up. User error? Quite possibly. Could the setup be more user-friendly? You betcha. They say there’s safety in numbers, but the 2014 Impreza proves there isn’t necessarily safety in size. While some larger crossovers have returned disappointing crash-test results, the little Subie earned an overall 5-star rating from the National Highway Traffic Safety Administration (NHTSA) and has been named a Top Safety Pick by the Insurance Institute for Highway Safety (IIHS). Nicely done. Part of the credit for those results goes to the Impreza’s 7 standard airbags, 4-wheel antilock disc brakes (vented front, solid rear) with electronic brakeforce distribution and brake assist, and the car’s crash-optimized construction. The available rear-view camera adds a little something to the safety mix, too, but that’s where the technology train ends, as the equipment list is completely devoid of blind-spot monitors, lane-departure warning and the like. Gauging the 2014 Subaru Impreza’s value proposition depends a bit on whether you’re talking about the sedan or the 5-door hatchback. When comparing the former to segment heavyweights like the Ford Focus and Toyota Corolla, the Impreza’s base price is on the high side, but when the standard AWD system—something those rivals don’t even offer—is considered, we’re back to a more level playing field. That may be a hollow point for shoppers in Arizona and Florida; however, for those of us who drive in more fickle environments, 4-corner traction may be worth paying a little more at the Subaru dealer. For the 5-door, the cost-effective discussion is more cut-and-dry. In this case, I looked at a revised set of competitors—the AWD Nissan Juke, as well as hatchback versions of the front-wheel-drive Ford Focus and Mazda3—and discovered the Impreza undercut those models by roughly $600-2,600. Of course, there’s more to this than just sticker prices. Warranties are comparable for the vehicles I’ve mentioned, most provide roadside assistance, and projected resale values are similar, with the Impreza landing on the higher end of the scale. Potentially countering those pluses is J.D. Power and Associates’ prediction of below-average reliability and a mediocre rating for initial quality. That’s news a prospective Impreza buyer doesn’t want to hear (chances are Subaru dealers aren’t too crazy about it either), though they can take comfort in a solid recommendation from Consumer Reports. That publication suggests owners of the 2014 Impreza will enjoy top-notch dependability from their new Subaru. 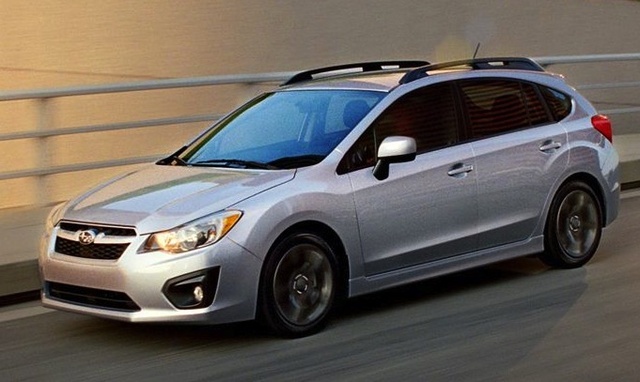 What's your take on the 2014 Subaru Impreza? 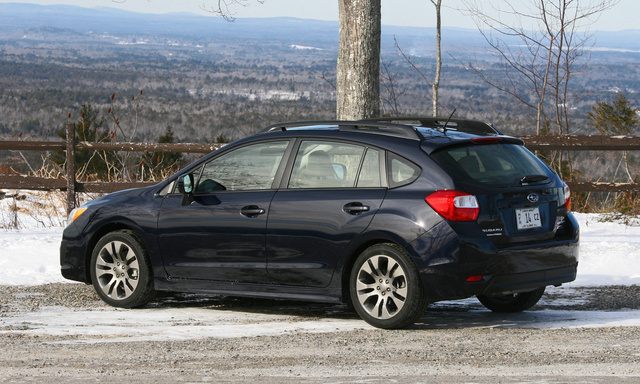 Users ranked 2014 Subaru Impreza against other cars which they drove/owned. Each ranking was based on 9 categories. Here is the summary of top rankings. 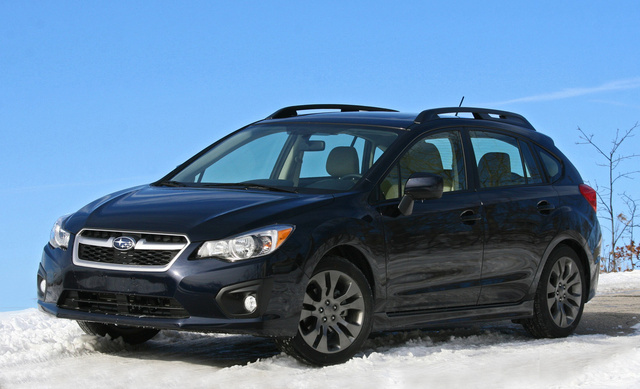 Have you driven a 2014 Subaru Impreza? Does this year model and engine size have a timing belt or chain? I'm no mechanic. In fact i'm just a housewife but can i diy my coolant flush?